All this week we've been doing dress and technical rehearsals for Theatre Guild of Rockingham County's production of Oliver Twist, which opens tonight. One of my fellow cast members, Sarah Al-Jouni, plays Miss Monks. And a few nights ago when I saw her in her full costume, well... she looked way too amazing to pass up the opportunity. I told her my idea on Wednesday evening and she thought it would be fun. So during the intermission of last night's rehearsal I went out to my car and came back with my Star Wars Force FX Lightsaber (the one that's the Lightsaber Construction Set, which I did wind up buying :-). Before I left home I made the handle look like anything but a Jedi hilt, and switched the blade color to red. And then we took some pictures. And when I got home I started playing around in Photoshop. 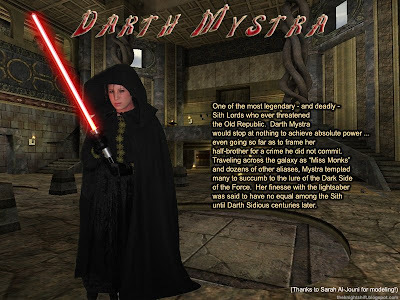 And now, here she is: Darth Mystra. Most of the cast was working to come up with a proper title for our very own Dark Lady of the Sith. "Darth Monks" and "Darth Emma" were suggested but in the end Sarah noted that Monks is mysterious and I "Star Wars"-fied it and gave her a bit of a background. You did the right thing to get Sarah's picture like that. She looks like a character straight from a Star Wars movie in that outfit! And good photoshopping job too! That's pretty awesome, I can't lie. The name, background, the Photoshop job, everything. Scott, for the background I chose a still of a Sith temple on Korriban from one of the Star Wars video games (can't remember which one it was, I just happened to have found it on the 'net. Might be one of the Jedi Knight ones). Thought it would be appropriate to set Darth Mystra on the Sith homeworld. Of course, a true Jedi would consider what you have done to be an outrage and a sacrilege. It's on par with an aboriginal woman playing a digeridoo. The Jedi Temple is a Males-Only world, as you well know, at least in the movies. It does look intriguing though...all that power in the hands of a woman. There have been female Dark Lords of the Sith with the "Darth" title. Darth Zannah comes to mind (the apprentice of Darth Bane, the one who instituted the "Rule of Two" that carried down to the time of Darth Sidious and Darth Vader). So does Darth Traya from the Knights of the Old Republic games. I think there've been at least two more female Darths named in the literature.